My day begins at 3:54 a.m. While rest of the city is still sleeping, I rise for morning conditioning. I choose to start strong every day so I can finish stronger and more healthy than the day before. I am a busy professional and don't have time to waste. The routines I prefer for morning conditioning include interval and bodyweight training. Each can be performed anywhere, without any equipment. Intervals give me the best bang for my buck, so to speak. In a few minutes of intense activity my energy expenditure soars! Conditioning is vital no matter when you do it. But, by starting at daybreak with heart-racing sprints, battle ropes, box jumps, and kettlebell swings, I stoke the fires in my metabolism for the remainder of the day. This is huge for people looking to lose weight. Couple early intensity with heavy lifting in the evening and you set yourself up for some incredible rest when your body is naturally on the mend—during sleep. Consider this: What do you do all night? Sleep, I hope! Your metabolism—at rest in sleep—is at its slowest first thing after waking. When you knock the early bird from its nest, you force your metabolism to fly. This begins an increased overall calorie burn throughout your day1. Morning exercisers are more likely to stick to a consistent exercise plan5. Even people with the best intentions create excuses and run into roadblocks throughout the day. But if you have 10 minutes, you can improve your conditioning. If you don't have a treadmill at home and can't make it to the gym in the morning, try these routines on a walking trail or in your neighborhood. Ideally, you'd perform this one-hour treadmill torture in one session, but if your time is scant, break it up. Do what you can in the time you have. Hold the bar/rail in front for stability. You don't need a fancy gym membership! You can do these circuits at home or in your hotel room. If you have access to a staircase, you're set. You can also use a chair/couch/ottoman for your stepping block or box. Opposite knee to opposite elbow. Twist side to side to activate obliques. Take every step as you go down, but skip every other step on the way up. 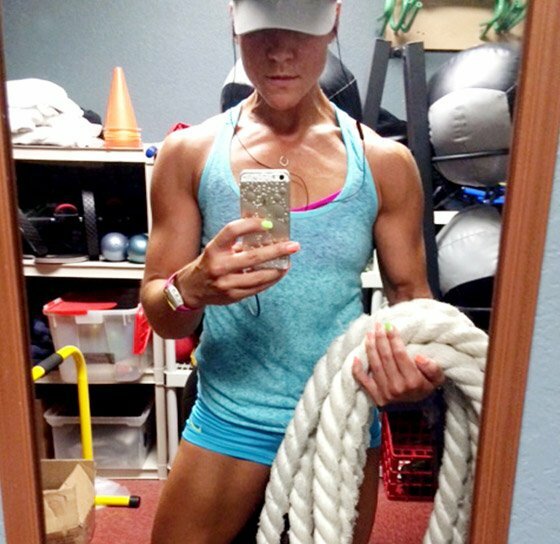 I don't know what it is about the ropes, but I feel like I could battle them for days! I focus on work and rest methods. Do you want the muscular legs of a sprinter or the wiry twigs of a marathon runner? Big, thick, beautiful legs come from intense sprinting. Get to a local school or park and do this while you have the run of the place. This routine makes you change planes of movement: flat ground, drop the hips for a lunge, and lift them to sprint the bleachers. Turn down? For what! Get up and get moving. This circuit engages the entire body. If you don't have a kettlebell, improvise; find something to lift. A set of medicine balls with handles will do nicely. Like high knees, but tap the top of the box with your toes. Stay in plank position after your push-up and bring opposite knee to opposite elbow. Every step going down, skip steps going up. If you're not a morning person, are short on time, or just forget to get started first thing in the morning, that's OK! Still, you want to get your metabolism moving before your evening lifting session. Try these sprints after you drop off the kids, during your first 15-minute break, or over lunch. In a pinch, use any of the in-home or bodyweight circuits above. Adjust to fit your time crunch and equipment available to you in the workplace, at school, or on the go. Look around for an apparatus (like a sturdy stool) you can use. Walk 100 Meters to rest between. You've had all day to prime your body for a successful evening weight-training session. Your muscles are warm and you've likely eaten a few decent muscle-fueling meals to supply the energy required to hit the weights. The evening is the optimal time to build muscle. Your morning conditioning will prepare you for the hard work in the weight room. They make a beautiful pair. If you start strong, you will finish stronger! "Running in the Morning & Lifting in the Evenings." Andrea Cespedes. AZCentral. Bowen, R. "Physiological Effects of Growth Hormone." Colorado State University. Dec. 24, 2006. Cruise, Jorge. 8 Minutes in the Morning for Real Shapes, Real Sizes. St. Martin's Press, 2003, p 74. Effect of Training Time of Day on Body Composition, Muscular Strength and Endurance; National Strength and Conditioning Association 2005 Annual Meeting, Timothy Scheett, Ph.D.
Sediak, M, et al. "Effect of time-of-day-specific strength training on serum hormone concentrations and isometric strength in men." Chronobiol Int. 2007;24(6):1159-77. "Best Time To Hit The Gym." Allison Van Dusen. Forbes. Feb 26, 2007. "Should I Lift Weights or Do Cardio in the Morning." Craig Smith. Livestrong.com. Jan 30, 2014. If you toss and turn all night, wake up groggy, and aren't getting the results you want in the weight room, then make some positive changes at home. Get to bed! Experienced strength athletes know that the secret to making big numbers move is the mindset of the weightlifter, not the size of his muscles! Even when you can't get to the gym, you can get in great shape. Try this full-body workout from former WBFF bikini champ Chady Dunmore!